Interested in attending our Street Lights: Illuminating Implementation and Equity in Complete Streets conference? The National Complete Streets Coalition has just released the event’s full agenda. 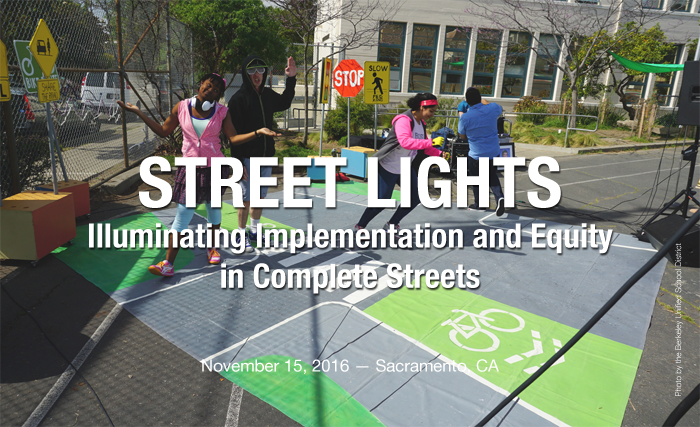 Taking place on November 15, 2016 in Sacramento, CA, Street Lights will be a chance for transportation planners and engineers, community, equity, and health advocates, local officials, and Complete Streets practitioners to share ideas, brainstorm solutions, and celebrate the success of the Complete Streets movement nationwide. Together, we will be focusing on implementation of and equity in Complete Streets. If you haven’t already, register to join us in November. Conference registration is $150 for Coalition partners, and $195 for non-partners. Become a partner today and one complimentary registration is included! Once you register, book your hotel room at a discounted rate in our block at the Citizen Hotel. A limited quantity of rooms are available, so secure your space today. Learn about becoming a conference sponsor.